My manner is calm and friendly, and I do what I am told. It's easy. I talk like them, laugh like them, tell funny stories. But with all the feeble elderly people under my care, things often slide out of control. A town in Norway – a park by the lake. Riktor observes the twitches and unintelligible noises of the child in her wheelchair. She and her chain-smoking mother come to the park every day. And so does Riktor. It is part of his daily routine, although he visits at different times of the day because of his shift work at the local nursing home. Riktor likes the park. Peaceful. Riktor doesn't sleep much, his nights are long and agonised. An articulated lorry parks by his bed every night with its engine churning and filling the room with diesel fumes. But he likes to think that he keeps a good grasp on reality during the day, it is only with the more helpless of his charges that things get out of hand. Riktor loves the peace of the park and in particular he loves the statue, Weeping Woman. The true condition of humanity, thinks Riktor, and when no one is looking he caresses her legs and slim body. In the park he also watches the man with the tremors. Most likely alcoholism, thinks Riktor. A thought which is confirmed by the man's hip flask. One day he leaves his flask behind. Riktor picks it up. It is inscribed to "Arnfinn". Riktor puts it in his pocket, perhaps Arnfinn will come back for it. Riktor also studies the other staff at the nursing home, in particular the beautiful, good, kind, Sister Anna. He loves Anna. But she is as sharp as she is good, Riktor takes special care not to reveal his ministrations when she is around – injections into the mattresses, food and medication flushed down the pan. And blind Nelly Friis, whose frail skin he pinches until it bleeds and whose thin hair he pulls. She can't call out. She can't see who it is. Although, sometimes, when Riktor accompanies Anna into Nelly's room she flaps her hands and grows agitated. Riktor's home is a small red house forty minutes walk away, with a veranda and the forest at its back. Riktor likes to walk to work whatever the weather. Walking brings order to his thoughts, those seething creatures that besiege his brain at sunset. He doesn't tell anyone about these thoughts, nor the lorry. Nor the fact that he can see in the dark – see the glowing life force of creatures and buildings. Riktor simply smiles and assumes a friendly expression. Karin Fossum is an award-winning Norwegian writer, one of the top names in Scandinavian crime fiction with her internationally published "Inspector Sejer" novels. 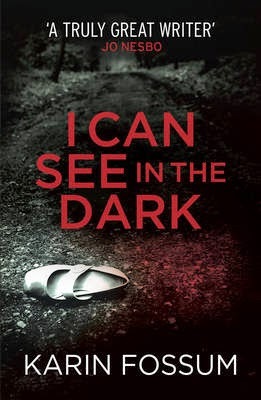 I CAN SEE IN THE DARK however is a standalone psychological crime novel. It brings us the narrative of Riktor, a nurse at a local nursing home, a tortured man with torturing ways. Nicknamed by a schoolmate "The Pike" (for his protruding jaw and teeth) he not only brings to mind the dictionary definition of a pike as "a predatory freshwater fish with sharply pointed head and teeth" but also its popular image as a cunning, voracious hunter, lurking under the river bank. Riktor befriends the alcoholic Arnfinn and the friendship reaches a terrible conclusion. But when a police inspector visits Riktor and accuses him of a crime, it is one he did not commit. Translated from the Norwegian by James Anderson (who has translated the novels of Karl Ove Knausgaard amongst others) the book reads beautifully. Fossum has so successfully and sensitively conjured Riktor, that I weirdly feel some sympathy for this sociopathic “villain”. The story manages both balance and suspense, and chillingly reminds us of the vulnerability of us all, including the isolated and disturbed Riktor. In an interview with The Independent a few years years ago, Fossum said: "I'm not a good crime writer. I'm not good with plots... so I have to do something else". 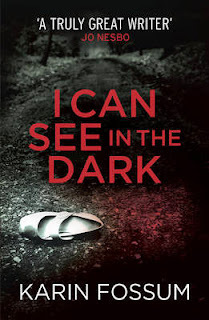 I CAN SEE IN THE DARK is a masterful and beautifully written "something else" amidst Nordic Noir and you have to read it.